Lessons take place once per week at the same day and time. Payment and commitment is on a monthly basis. A trial lesson is available for $22/45-min. Performance Opportunities will be regularly available according to student demand. (Ages 7-Adult) I tailor voice lessons to each individual student by discovering your needs and then working with you toward creating a plan to meet your singing goals. All lessons involve vocal warm-ups, technical exercises, and songs appropriate for your voice type and level. I encourage all students to collaborate in the process of selecting a mixture of songs you enjoy and also some songs to learn new styles and stretch your comfort-zone. I work with singers from beginner to advanced, and in styles including pop, classical, classical-crossover, R&B, praise & worship, jazz, musical theatre, and more. I am a trained classical singer, and I apply a classical approach to breathing technique, posture, and vocal warm-ups and technical exercises. This is because I believe that using a classical-inspired approach when exercising the voice is an effective way to build resonance, health, endurance, volume, control, and many of the other skills singers come to me asking to work toward. However, I recognize that singing non-classical songs requires a more flexible aesthetic approach and so I work with the singer to achieve a style and sound that is pleasing to the singer and his or her audience. You can expect to make a lot of new sounds in the practice room, but to be able to present a polished and exciting finished product in your performing (or in your singing for pleasure, if you’re not interested in performing). 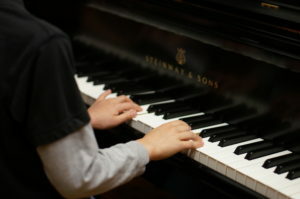 (Ages 4-Adult, beginners and early intermediate) I work with my beginning piano students on acquiring a strong knowledge of music theory and learning how theory can strengthen practical playing skills. I believe it is important for musicians to learn to play expressively, even from the beginning. This means we work to learn how to interpret the notes and rhythms on the page while also listening for beauty in the sound. All students will work on essentials such as rhythm, keeping a steady tempo, note-reading, sight-reading, dynamics, and musical terminology. After the basics are established, we move on toward more complicated rhythms, higher and lower notes on the keyboard, use of the pedals, harmonic and melodic intervals and five-note scales. Later, students will begin to learn major scales, arpeggios, and chords. Each level includes compelling music to apply these techniques. I have used the following piano methods with my students, and I select which method I believe will be the best fit for you: Alfred’s Basic Piano, Bastien Piano Basics, Faber Piano Adventures. (Ages 8-Adult) Flute lessons will follow the traditional classical model of instruction. For beginners I often use the Trevor Wye method books, Rubank Elementary book, or Patricia George’s Flute 101. Intermediate students will continue with the appropriate method book and begin to supplement with two- and three-octave scales and arpeggios as well as the standard flute etudes. All students are welcome to suggest their choice of songs to supplement their standard music. Often, students will choose songs from movies, church, pop songs, etc. Students can expect to work on breathing, posture, and all of the musical basics listed above under piano lessons. (Ages 4-Adult) Recorder lessons are available for those flutists who are too small to be able to comfortably hold the instrument, with or without a curved head-joint. Starting on recorder is a great way to begin playing and reading music without the added difficulty of holding the transverse flute. It is also a very affordable option for students who would like to try lessons without the added investment of an instrument, as recorders are available for $10-$20. Once the student grows enough to be able to hold the flute, transitioning to the full-sized instrument requires less effort than when first starting out. Recorder lessons are also available for interested adults who would like to try out a fun and inexpensive instrument! Copyright © 2019 Tiffany Thorpe Music.